Lizzie Boylston is a midwife in the tumultuous times of the Revolutionary War, when neighbors could very well be enemies and the tension between the Tories and the Whigs was bordering on hostile and murderous. Who is a friend? Who is an enemy? Who is a spy? Striving to make ends meet honestly, by delivering babies in the homes of the neighboring women and survive the passing of her patriotic husband as a proud war widow, Lizzie finds herself drawn into a dangerous world she never could have imagined, where no proper woman should ever find herself…Dressing in disguise and entering the most dangerous of places to find information that will help herself and her closest friends, and maybe even General George Washington, himself-and avoiding the advances of not one, but two gentleman who seem to have taken a fancy to her no matter how much she resists. This novel brings to the surface the hardships faced by the colonials as they struggled to survive during the oppression of the Revolutionary War , when able-bodied men were scarce and all resources went towards the cause of independence. 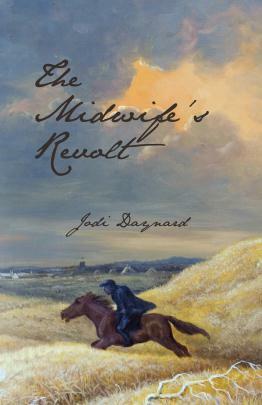 If you love historical fiction with a touch of romance and a mass of mystery and intrigue, you will love The Midwife’s Revolt, by Jodi Daynard. This novel is NOT a bodice-ripper, but a truly devoted historical work of fiction which details the actual lives of people who tended farms, caught small pox, sent quilts to the colonials in combat, and struggled to raise children as the men fought for the cause of independence despite the danger and struggle it brought upon their families. If you love American History, this novel will blow your mind, especially if you have any interest in the science of midwifery and its history in the United States. Fans of The Midwife of Hope River, by Patricia Harman, will truly adore this novel. Don’t hesitate to pick this one up if it sounds like something you will enjoy. Highly recommended!